Chicago Teachers Union Vice President Jesse Sharkey said Gov. Bruce Rauner "knows nothing about real education." THE LOOP — A leading official with the Chicago Teachers Union called Gov. Bruce Rauner's plan to seize state control of Chicago Public Schools "an educational abomination" Wednesday, adding that the governor "knows nothing about real education." "Gov. 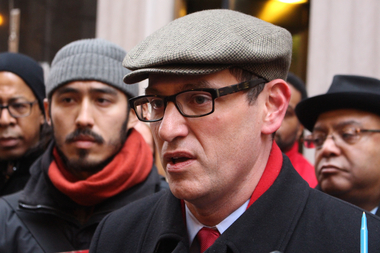 Rauner's threat of a takeover of CPS represents an educational abomination," said union Vice President Jesse Sharkey. "This is a guy who knows nothing about real education." Rauner was in Chicago Wednesday for a media event, but did not respond directly to Sharkey's comments. Instead, he lashed out at Mayor Rahm Emanuel for presiding over the ongoing conflict between the school district and its teachers, saying the mayor was "flailing, floundering and failing" on education. Rauner re-emphasized his support for bills in the General Assembly allowing the state to take control of CPS, and also allowing the district to possibly seek bankruptcy protection. He denied that his bid for a state takeover and district bankruptcy was intended to undermine an $875 million CPS bond sale set for Wednesday, dismissing those charges as "ridiculous." Sharkey charged the governor was out to "pressurize and scare people to drive the district into a financial crisis in order to enact his 'turnaround agenda' in Springfield." Rauner has repeatedly connected CPS funding with the state's budget impasse and has refused to budge on either unless receiving major concessions from unions and other reforms that he says are pro-business. Sharkey made the statements as the union closed its account at Bank of America to protest what it calls "toxic interest-rate swaps" in loans to CPS. The union charged the bank has made $77 million on those deals, including $40 million this year in early termination penalties as the district refinances loans. The union accused the bank of misleading the district and urged CPS to contest the charges in court. The union withdrew the $726,000 it had deposited at the bank and planned to transfer it to another bank not involved in those "toxic" loans.